24-Oct-2005 -- I remember reading about the Degree Confluence Project prior to this deployment to Iraq, but with the busy schedule we carry, I had forgotten about it for the last 10 months. With my replacement on the ground and a little free time on my hands, I decided to make an attempt to visit some confluence points in Iraq. One point near the base where I am stationed remains elusive; several attempts to visit there have resulted in failure. We had a mission planned to another base some 200 miles away and I wondered if I might have another chance. I checked the map and found that 31N 46E was right inside the patrol area that we would be transiting. I traveled to Tallil Air Force Base (renamed Ali Base, but we still call it Tallil) with 2LT (Second Lieutenant) Paul P., TSgt (Technical Sergeant) Robert L., SGT (Sergeant) Rene M., and SGT John McC.. We departed our base on 22 October 2005 in the early morning. As we pulled out of the gate, we mentally prepared ourselves to convoy the 200 miles to get to Tallil, near al-Nāṣiriyya in southern Iraq. At the 15-mile point, we passed the location of an attack that killed two of our own on 28 September 2005. SGT Steve Morin was only the second Texas Army National Guard soldier to fall to enemy fire since World War II. Airman First Class Elizabeth Jacobson was the first Air Force Security Forces (military police) Airman to fall to enemy fire in 30 years (since Vietnam), and the first female Air Force member to die in Iraq. We all silently said our prayers and thought of them as we passed. They will always be in our memories. We arrived at Tallil shortly before noon, just in time for lunch. Following lunch, we made our way to the ancient city of Ur. Perhaps the oldest city known, Ur is home to the first known museum, birthplace of the arch (yes, the Romans "borrowed" the arch from the Sumerians and popularized it by using it extensively in their architecture), Ur is also the birthplace and home of Biblical Abraham, and the location of the 4,200-year-old Great Sumerian Ziggurat Pyramid. We took a guided tour provided by an Iraqi Ministry of Interior archaeologist and tour guide. The pyramid is located only 6.6 miles (10.7 km) ESE of our intended target, 31N 46E. While atop the ancient pyramid, my Garmin gave the coordinates 30° 57' 45.9"N 46° 06' 11.1"E.
Two days later, as we planned our mission, I requested a route that would take us near the confluence point. If we were able, we would stop by and photograph the point. Our combat patrol departed after lunch. We were joined by TSgt Jeff G., SSgt (Staff Sergeant) Samuel F., A1C (Airman First Class) John W., A1C Justin T., and Iraqi interpreter Karīm. We headed north along MSR (main supply route) Tampa a few miles until we reached an overpass. Some high-tension electrical wires ran east and west over the main Iraqi highway. We turned west on a dirt road and began driving west. The terrain out here is flat and barren. The hot summer months have dried the land and dust storms are a daily occurrence. But today is cool, only about 78 degrees Fahrenheit (26°C), much easier to endure than the 130-degree temperatures (54°C) we experienced just two months earlier. The hot weather is especially brutal when wearing body armor and carrying a full combat load. 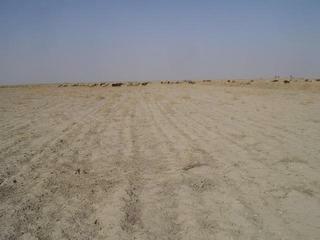 It is hard to imagine crops growing here but soon the rainy season will be upon us. Bedouin camps dot the landscape and irrigation canals cut across the farmland. In hindsight, it would be impossible to reach this confluence point by vehicle during the rainy season because the canals would be full and the farm land would be impassible mud. As we continued west along the dirt road, we reached a point due north of the confluence point. We turned off road and headed south. We were driving across a checkerboard of cultivated dust. You could see where past crops had been planted – and would be planted again when the rains returned. About one kilometer to the South, we came across an Iraqi mud and brick farmhouse with several tractors in the yard and some palm trees providing shade. One of the home's residents came out to see why were driving near his house. We waved and smiled, he waved back. We came across several irrigation ditches (dry) that were too deep to cross and we had to drive further west until we could find a fording location. When we came to another, yet larger canal, it seemed larger than the others. The GPS read that we were 150 meters from our location, so we decided to walk the rest of the way on foot. We dismounted our Humvees and walked in a southwest direction until we arrived at 31N 46E. As I took pictures (the Ziggurat Pyramid on the horizon appears as a small dot on the horizon right of center on the East view photo), a man, followed by 100 or more sheep, approached from the South. Our interpreter greeted him and he introduced himself as Mohanen. He asked why we were there and if there was any problem. We tried to explain to him the significance of this point in his field, but he did not seem to understand. I finally told the interpreter to tell him that we were there as part of a geographical survey, he seemed to accept this answer. We were about to take a group photo in front of the confluence point and we asked him if he would like to join the photo. He agreed. The confluence point is about 10 meters behind us in this photo. For the security of our interpreter and his family, his face has been obscured. While we were talking to the man who owned the land where the confluence point was located, residents from the nearby farmhouse that we passed to the northeast (visible on the horizon between my right shoulder and Mohanen's left shoulder in the group photo) came out to see what was going on. We talked with them briefly and offered them some cold water and snacks. They were very grateful and thanked us. We said goodbye, mounted our vehicles, and continued our mission. On the return to our base after this mission, we stopped to help an Iraqi man who had flipped his vehicle and was in dire need of medical attention. While we were giving aid to the injured man, Sergeant Christopher Monroe was killed in the line of duty. His death was reported in the media as the 2001st US casualty in Iraq. His memorial service was yesterday. Our thoughts and prayers are with his family. I would like to dedicate the confluence point at 31N 46E to Sergeant Steve Morin, Senior Airman Elizabeth Jacobson, and Sergeant Christopher Monroe.